Once gas ages, it loses some of the combustibility to fire up an engine, but its flammability makes it a pain when it comes time to dispose of it. Get the lowdown on how to get rid of your extra supply safely. From powering vehicles and generators to garden tools, gasoline makes our world go around. Leaving unused remnants of the fuel stored too long in your garage or sitting in a riding lawnmower all winter, however, risks it degrading or becoming contaminated during that time. At this point, you need to deal with it through legal disposal or through reuse after dilution. Improperly and illegally disposed of gasoline—that which is poured onto land, into storm drains, or down toilets—can incur fines, damage the landscape, kill animals, contaminate water sources, and even pose a serious fire risk. Check the appearance and smell of the gasoline to determine its usability. If the older gas isn’t contaminated, dilute it with fresh fuel for reuse (optional). Locate the nearest hazardous waste disposal in your area. Transfer gasoline to a government-certified container. Speedily and thoroughly clean up any gasoline spills. Transport gasoline to disposal center. 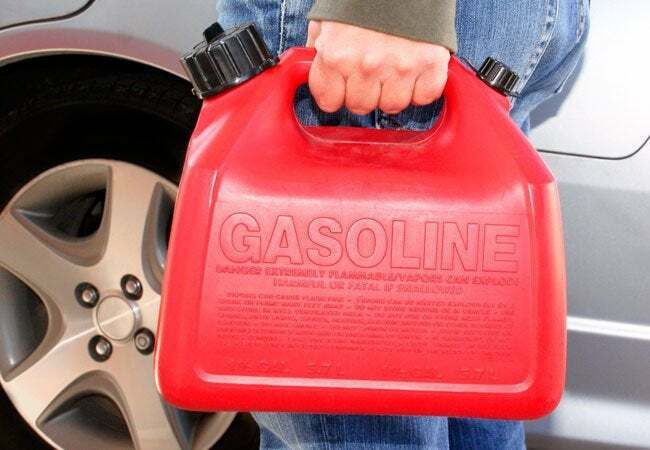 Read on to learn about how to dispose of gasoline safely and responsibly. STEP 1: Inspect whether the gasoline is old or contaminated. To see if gas is old or contaminated, pour some in a glass container. In another container, pour some fresh gasoline for comparison. If the questionable gas is darker or smells more “sour” than the fresh gas, it has likely aged to the point of losing efficacy. The addition of ethanol, which is a preservative, has made today’s gasoline more shelf-stable than fuel of years past. Still, gasoline that sits more than a couple months in storage (and an unknown length of time in the gas station’s tank before that) degrades and loses combustibility, which can ultimately inhibit its ability to fire your engine. While old gasoline won’t hurt an engine, it’ll just make it run inefficiently or fail to fire at all. You can certainly dispose of old gas, but you can also reuse it by diluting it with fresh gas (see Step 2). However, if the leftover gasoline shows particles of rust, dirt, or discoloration, it may be contaminated. Do not reuse this fuel. Instead, skip to Step 3 to dispose of it, since those particles can clog fuel lines and carburetors. STEP 2: Use up old gasoline. On its own, old gas has lost some of the potency that would have enabled it to fire an engine, but it’s often safe to use up by diluting with newer gas in the tank of an outdoor power tool or vehicle. Follow the right proportions, and the old gas will lower an entire gas tank’s combustion ability by so little that it’s less of a concern. If there’s only a half tank or less of old gasoline in your lawn mower, filling the rest up with fresh gasoline might dilute it enough to get the engine firing. You’ll burn through it pretty quickly as you work in your yard. You may choose to top it up with more fresh gas midway through use to get a little more oomph from the fuel. For larger quantities of gas, you can dilute it in your car or truck’s gas tank. First, check your vehicle owner’s manual or look online for its tank capacity, which ranges from 9 gallons to 16 gallons. For a small tank of 9 or 10 gallons that reads at least ¾ full, according to the fuel gauge, add a half-gallon of old gas to the tank. 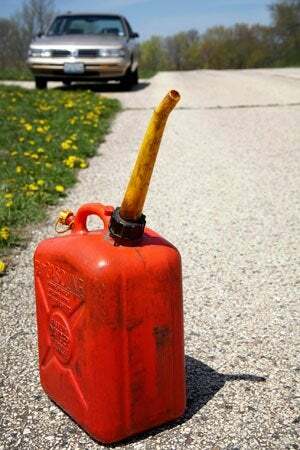 Use a proper “jerry can” (a gas jug with pouring spout) to slowly pour the old gas into the tank. Eyeball the gas level as you fill it, and stop when the tank is filled to just below the tank mouth’s safety flap. (That metal flap gets pushed into the tank mouth when you insert the gas nozzle; it’s designed to prevent gas from spilling into the area between the tank mouth and the gas cap, so you don’t get rude surprises when you take the cap off.) Similarly, you can add ¾ of a gallon of old gas to nearly full 12-gallon tanks, or a full gallon to 16-gallon tanks. When adding old gas to fresh gas in a vehicle, you may also ask employees at your local automotive supplies shop whether using fuel additives would allow you to increase the ratio of old to new gas in your tank so that you could use the supply up more quickly—and, if so, which additives they recommend. Octane boosters, injector cleaners, and other products can prove useful for using old gasoline, depending on the engine in question and the kind of fuel you’ve got, which these professionals can assess. Of course, you can choose to dispose of old gasoline. In fact, it’s wise if the fuel is an especially dark color, such as rust-brown or “milk chocolate” compared to fresh gas, so that you don’t risk gumming up your engine with deposits or impurities. STEP 3: Research the nearest disposal center for old or contaminated gasoline. Search online for “hazardous waste disposal center” in your county, city, or state. Call your county or city waste management agency and ask where gasoline goes. Check with your local fire department. Given the flammability of gasoline, they frequently can suggest how to handle the gasoline and where it should go. Ask your auto repair shop if they would take the gasoline off your hands. Many will not, as it can be an expense to them to deal with it on your behalf, but it’s worth the question if you’ve already got a great relationship with an auto repair shop. STEP 4: Transfer gasoline to a government-certified container. Pour slowly to avoid splashing, static, or spillage, and fill no more than 95 percent of the way to leave room for the fumes. Keep your face as far away from the spout as possible to minimize the amount you inhale. Immediately after you’ve finished pouring, tightly seal the container with its lid to prevent spills or leaks. Place the container upright in a second receptacle, such as a rubber cooler or bin, in case it should topple over as you’re driving and suffer a leak. Then wash your hands thoroughly, in case any has splashed on you. STEP 5: Deal with any gasoline spills. If any stains have gotten on your clothing, change your clothes and address the stained set. First, you’ll want to blot the excess off with a white cloth. Cover the affected area with baking soda to absorb whatever your cloth cannot; let it sit for a few minutes, then brush it clean. Finally, rub liquid dish soap into the stain to treat it five minutes before laundering the clothing by itself in the hottest water its fabric can take. Line dry only until you’re sure all traces of gasoline have completely been removed; otherwise, lingering gasoline can cause combustion in the dryer when exposed to heat. If you spilled gasoline on the driveway, soak up as much of the fuel as possible with an absorbent product, such as kitty litter. It may take a few hours to absorb the spill, then sweep up the litter to dispose of with your liquid gasoline. You can address any stain that remains with our driveway cleaning tips. STEP 6: Transport gasoline to disposal center. Drive carefully, and never, ever smoke in the vehicle while transporting gas. Fumes could be lingering or gas could have splashed on you, and it takes very little gasoline to be combustible with open flames in a small space. 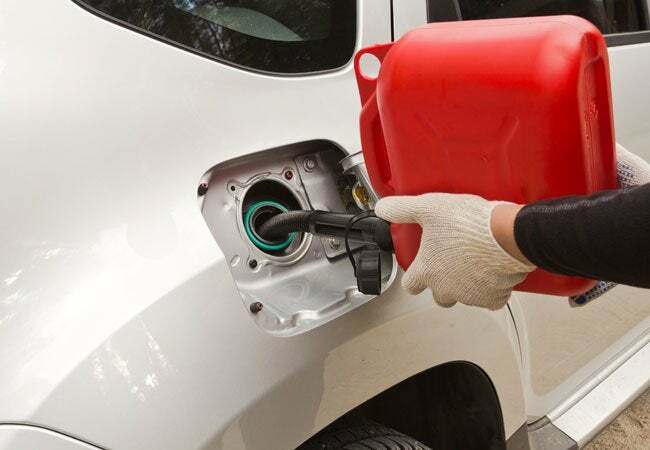 Once you reach the disposal center, you should be able to empty your gasoline into their storage vessel and take the empty 5-gallon jug home for the next time you have to dispose of gasoline responsibly. Gasoline is highly toxic and flammable, so take precaution when transferring and disposing of the substance. Follow this advice and more from the US Government’s Medline Plus. It’s dangerous to inhale in large quantities, so work outdoors if you can. If you can’t, get to fresh air quickly if you notice it burning in your lungs. If you accidentally swallow gasoline, drink milk immediately and call the Poison Helpline at 1-800-222-1222. If you get gasoline on your skin or in your eyes, flush it out with lots of cool water for at least 15 minutes. See a medical professional if it continues to burn or affect you after the 15 minutes has lapsed.